This is my modern version of a hot-water bottle cover. The cover is designed to fit a microwavable hot pad - link for this under "materials". The pads are conveniently small, and much safer (to lie on) than a hot-water bottle. 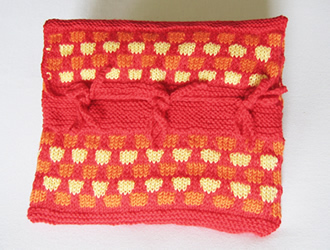 The pattern stitch from 1968 was used for a tea-cosy (colours Jade, Pink, and White), and a cushion cover (colours Brown, Amber, and White). I think the cushion cover, (style and colour scheme), is more authentically late 60s that the cosy. Although a tea cosy was de rigeur in our house, I think tea bags with and without the use of tea pots was becoming more prevalent by that time. With No. 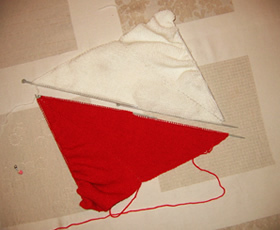 11 needles and main colour (red), cast on 58 stitches. Knit 4 rows in garter stitch (every row knit), then one row purl. Do not break off the main colour (red). Row 1: (right side) *K4, slip 2; repeat from * to last 4 sts, K4. Row 2: *P4, slip 2; repeat from * to last 4 sts, P4. Row 3 and 4: As rows 1 and 2. Break orange wool, and continue in red. Row 7: Using the third colour (yellow) K1, *slip 2, K4; repeat from * to last 3sts, slip 2, K1. Row 8: P1, *slip 2, P4; repeat from * to last 3sts, slip 2, P1. Row 9 and 10: As rows 7 and 8. Break yellow wool, and continue in red. Rows 13-24: repeat rows 1-12. Rows 25-30: repeat rows 1-6. Repeat from ** to ** three times, then rows 1-30 again. Change to number 11 needles and work in garter stitch for 4 rows. Cast off. Making up - Press the piece lightly on the wrong side under a damp cloth with a hot iron. Fold the cover to form a bag as shown in the picture, and sew up the side edges, on the inside, either oversewing or with backstitch. Sew in all the ends on the wrong side. With right side facing, starting at the side edge, work 6 dc up edge of the garter st band, 15 dc up the honeycomb edge, 2dc up to corner, 3 dc into the corner st.
Then work across the cast-off edge making 2 dc into every 3 cast off sts approximately. After the first 6 dc (or where you want to place a tie) work the first tie by making 40 chain, then working 1dc into each chain back down to the knitted edge. Continue to work dc into the cast-off sts, making a second tie in the centre of the flap, after approximately 14 dc. Work another 14 dc and make another tie (match the position of the first tie). Work to the edge, 3dc into the corner st and then finish to match the other side of the flap. Work 3 more ties by making 40 chain, then working 1 row of dc into each chain. Sew the ties on to the cover to match the positions of the ties on the flap. 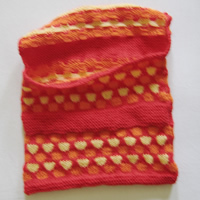 Original pattern calls for three contrast colours, (red, orange and yellow). Example shown is knitted in 4 ply - 1 x 50g ball of each colour. One pair each of number 10, an No 11 needles. One hot water bottle "replacement core", (available to order on the web). 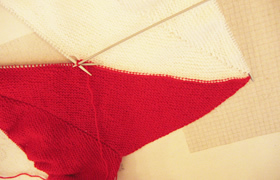 The wool should knit to a basic tension over st st of 28st to 4 inches (10cm) on No 10 (3¼mm) needles. I used Phildar Lambswool (a 4 ply wool/acrylic mix) left over from another project. 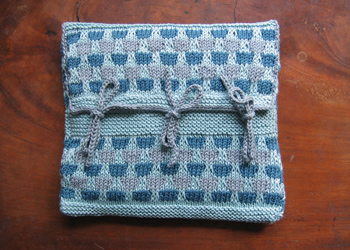 Here is a version adapted for a light worsted cotton yarn (Rowan Cotton Glace). For this version, cast on 52 sts. This is a pattern from 1956 "reversible bottle-cover" (sic) - though why the quotes, why the hyphen, and why the description reversible, I really am not sure. Originally a cover for a hot-water bottle, I have adapted it to fit a microwavable pad. The knitting turned out to be an interesting shape, and in consequence made for an interesting pattern, (probably not as intended). 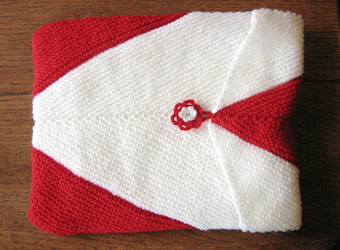 I used a bright red and white combination, which reminded me of a 1950s accessory set. The original recommended colours were "powder blue and white". In the days when pattern illustrations were not in colour, the colour names were much more vivid and descriptive; modern names tend to try and evoke an emotion rather than a colour. I do love reading these old patterns with the colours - "lipstick red" "primrose yellow" "mimosa" "frosty lime" - you could just eat them - a feast for the mind's eye. First piece - with No. 11 needles and first colour, cast on 4 stitches. With the right side facing for row 7 place a row marker on this side of the work, to mark it as the right side of the work. Then continue working as before, increasing at both ends of the row, and in the middle, on odd (right side) rows; increase only in the middle on even (wrong side) rows. 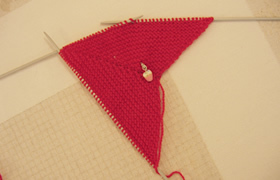 After a while, the stitches will become crowded and the shape hard to manage on just 2 needles. 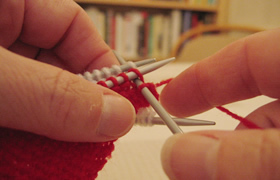 At this point, spread the sts evenly across two needles, discarding the centre st marker; continue to work back and forth across the needles using a third needle. The work will take on a triangular, or arrow shape. Continue working until you have 105 sts on each side of the centre. Leave the completed piece to one side without casting off. Do not break off the wool. Second piece - work a second triangle (or arrow) in the contrast colour. Lay the pieces out with the point of one arrow to the base corner of the other arrow, (see picture below). Continue working with one of the available colours (I used the red). 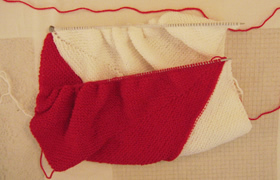 Cast off the two rows of knitting together, using a "three-needle cast off"(see picture below), fairly tightly. Cast off the two rows together. You are left with a sort of tube; turn it so that the cast off edges are inside. The next picture shows a hot water bottle placed in the tube. The arrow points are arranged centre front and back. 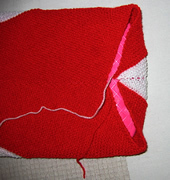 Fold up one of the ends and sew the diagonal seams in place from the wrong side. (I sewed the tip of my white arrow for the closed end). At the other end, make a chain using the crochet hook and sew in place as a loop for the button at the (red) arrow tip. Place your "replacement core" in the cover and fold over the top of the cover to an appropriate position and mark the place for the closing button. Make a crochet flower to act as a button, and sew in place. [Editor's note: You know ho to make a crochet flower without instructions don't you? Crochet flower - begin by making a slip loop with your first colour as if you were starting a crochet chain, and crochet into this loop for your first round. Ensure that the loop "slips" (can be tightened) from the tail end of your work, not the working end. Round 1: using the first colour, crochet 8 dc into your loop; adjust the slip loop until the sts fit nicely. Round 2: chain 3, (1 htr 1ch) into each of the 8 dc then ss join to the first 3ch. Round 3: 1dc into first chain space, (3ch, 1dc into next ch sp) to end of round, 3ch, ss into first dc. Fasten off. Make a second flower in the second colour. Round 1: using the second colour, crochet 8 dc into your loop; adjust the slip loop until the sts fit nicely. Round 2: ss into first dc, (3ch, ss into next 1dc) to end of round, 3ch, ss into first dc. Fasten off. Place second flower on top of first, and sew through both layers, onto the cover at the marked position for the button. Original pattern calls for 2 oz each of two contrast colours in 3ply. One pair of number 11 needles, with a spare pair (or set or 4) to aid in the construction. One No 11 (3mm) crochet hook. Garter stitch is difficult to measure but the wool should knit to a basic tension over st st of 28st to 4 inches (10cm) on No 11 (3mm) needles. I used an acrylic 4ply; not ideal, but these covers can take some wear and tear.